I recently acquired a new computer programming book entitled Seven Languages in Seven Weeks (by Bruce A. Tate, published 2010 by the Pragmatic Programmers; ISBN: 978-1-934356-59-3). As the name suggests, this is an introduction to not one but seven different programming languages and is designed to be worked through (it’s very much a hands-on kind of book) in a fairly short space of time. Rather than purporting to provide complete coverage of each language (which would be impossible, probably even for a single one of them, in just one book) it aims to give a fairly general introduction to each one and demonstrate some of it’s particular characteristics, leaving the reader to hit Google in search of further documentation etc. As well as giving you a broad exposure to a range of different programming paradigms, this book is intended to equip you to pick up the elements of a new language quickly and efficiently. The seven languages covered by the book are (in order of appearance): Ruby, Io, Prolog, Scala, Erlang, Clojure and Haskell. I’ve just started working on the Io section of the book and, if all goes according to plan, I intend to write a blog post about each of the languages once I’ve finished the relevant section. For now, I’ll focus on Ruby. Of all the languages in the book, Ruby is the only one that I already have a reasonable amount of familiarity with (although I’ve played a bit with Prolog and I’m fairly sure I had a quick look at Haskell once too). I have already written a handful of, admittedly fairly small, real world programs (as opposed to tutorial exercises) in Ruby, which could reasonably be described as a general purpose scripting language. At the moment, I would probably describe it as my second choice go-to language for general purpose programming; Python would be my first choice, largely because I’ve been using it for somewhat longer, am a lot more familiar with it and have a bit more dead-tree-format reference material for it; they are both excellent languages (each with several definite pros and cons relative to the other) and I’d rather get reasonably proficient at both than concentrate exclusively on either one of them. The particular (though by no means unique) feature of Ruby that Tate focuses on in his book is metaprogramming, which (he says) “means writing programs that write programs”. I’ve come across the idea before, mainly in my studies of Lisp (although I didn’t quite get as far as doing any metaprogramming for myself). I still don’t feel that I entirely grok the concept, but I think it’s definitely something worth exploring further and it appears that Ruby will be a good vehicle for it. I fairly recently started (or rather restarted, as it’s an old project I started and abandoned several years ago) a programming project using Python, so I’ll probably try to get it finished in that language. However, the next time I have a real-world problem to solve with a script, there’s a good chance I’ll reach for Ruby. I mentioned the other day that I’d got myself a new Raspberry Pi computer and promised to say more about it soon, especially the fun I’ve been having with its GPIO port. This post was slightly delayed due to the pressing need to write about other Pi-related stuff at the end of last week, but here it is now. The Broadcom BCM2835 chip at the heart of the Raspberry Pi has 8 GPIO pins (as well as several other pins that are accessible by the user for various purposes that I haven’t yet figured out) and a nice, shiny 26-pin (IIRC) connector to make all of the pins accessible. Unfortunately that includes about half a dozen pins that can fry your chips if you connect stuff to them. Also, it’s not terribly convenient to connect wires directly to these pins. For these reasons, I decided to invest in a cheap, simple and potentially extremely useful accessory called a Slice of Pi (NB I have no connection to Ciseco, the company that sells this product, apart from being a satisfied customer). This is described as a “breakout board” and plugs in to the GPIO port on the PI, providing nicely labelled female connectors (i.e. sockets rather than pins) for the pins you can usefully use while hiding the ones that are liable to destroy the processor. The Slice of Pi comes as a PCB with a bunch of loose connectors that need to be soldered into place. As well as being, presumably, slightly cheaper for the company to produce, this gives you the flexibility to only include the connectors you actually need. Fortunately it is not a particularly difficult soldering task to assemble the board, as my soldering skills are not the greatest. Armed with my new Slice of Pi and a bunch of electronics stuff that I’ve had for years (since a previous occasion when I got interested in electronics), I have been able to wire up a few simple circuits to test out the GPIO capabilities of my Pi. So far, this has amounted to a few LEDs and a switch (plus a bunch of resistors and some wires) and all I’ve done with them is to make the LEDs flash in pretty patterns (hopping from one pattern to the next at the press of the switch) but I look forward to being able to move on to bigger and better things soon. 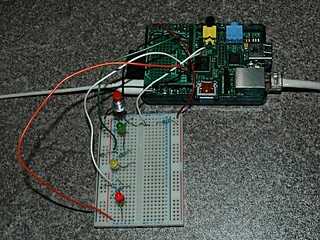 On the software side, the GPIO port is controlled by a library for your programming language of choice. At least, I assume there are GPIO libraries available for several languages. So far I’ve only looked at Python, which is the Raspberry Pi’s language of choice (and the reason for the “Pi” bit of the name, although they don’t tie you into using just one language) as well as one of my own favourite programming languages (and probably my strongest, to boot). Having accomplished my first goal of getting the Pi to flash LEDs in pretty patterns, my next task is to figure out some actually useful things to do with the GPIO port.